Windfall covers up 9.7% school budget increase! | Look Out Scarborough! 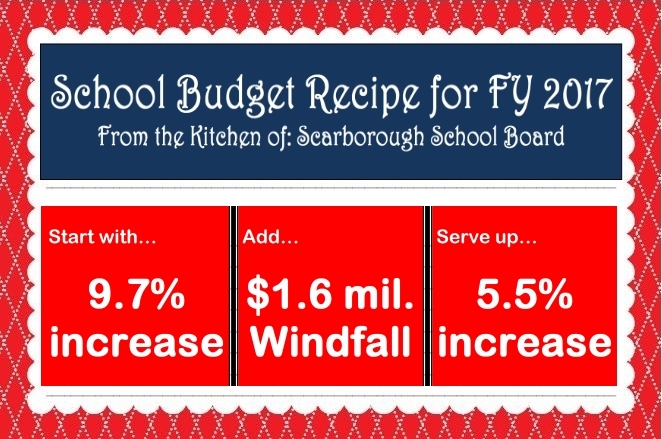 Windfall covers up 9.7% school budget increase! Joy! Joy! The big reveal of the Fiscal 2017 budget happened at the April 6 Town Council meeting. Kudos and self-congratulations filled the Council chamber like the fumes in a poorly ventilated diner. After all, an overall tax rate increase of 3.3% had just been announced, including an increase in the school budget of only 5.5%. What’s not to be happy about? 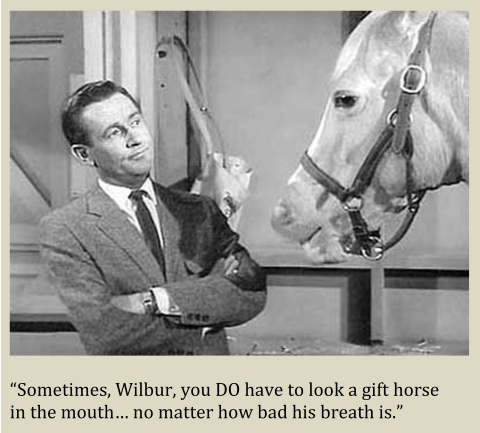 Well, friends, it once again falls to us to prick the balloon of unjustified glee. 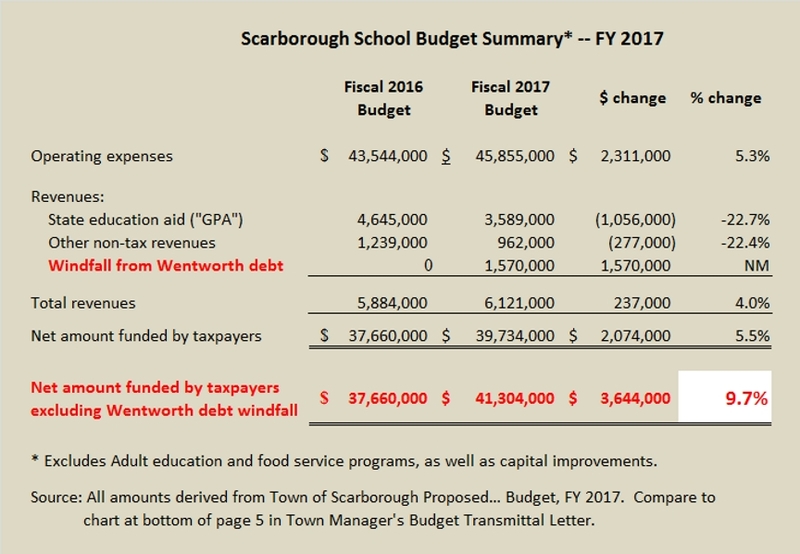 Given the budget history of the school department over the past few years, doesn’t a proposed increase in the school budget of only 5.5% seem a bit too good to be true? Yes, it does. And yes, it IS too good to be true. 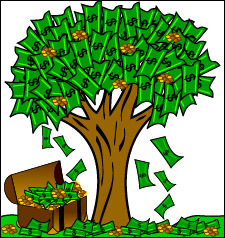 There is NO MONEY TREE in Scarborough! Basically, we borrowed $2.6 million more than we needed for the Wentworth School construction. And that excess is being used (legally) to pay some of the interest and principal on the bonds, both this year (FY 2016) in the amount of $1.0 million and next year (in the FY 2017 budget) in the amount of $1.6 million. As a result of this one-time windfall, the taxpayer funding of the Fiscal 2017 school budget has been artificially reduced by $1.6 million. Without that windfall, the amount of taxpayer funding of the schools would have increased by 9.7% over the FY 2016 budgeted level. Yikes! Note that there is nothing illegal or even shady here. On the other hand, the currently proposed budget is just plain fiscally irresponsible. It masks significant issues in the current year which will bite all taxpayers in the posterior in future years. It sacrifices responsibility for expediency. If this budget is an example of the sort of life values that are being taught in school, we are all in deep trouble. Breathtaking, isn’t it? Even after using $1.6 million of “free money,” they still want taxpayers to pony up 5.5% more than last year. If this isn’t a recipe for disaster, we don’t know what is. 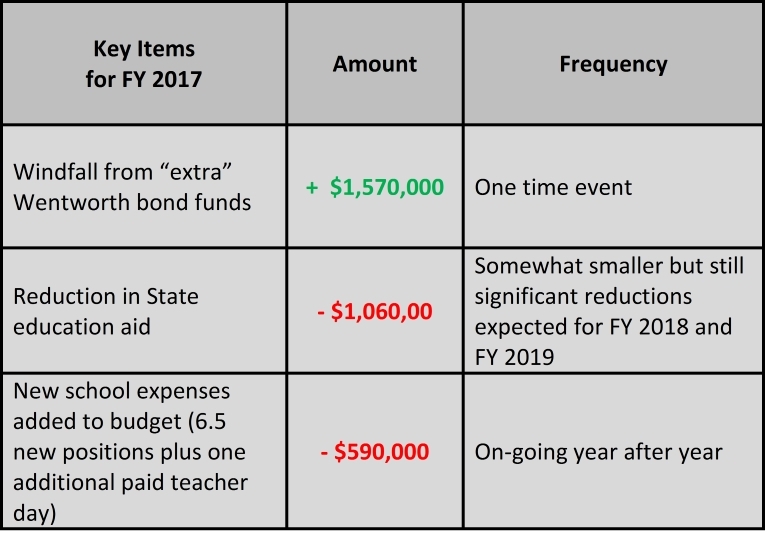 As you see above, that one-time windfall just about cancels out the impact of the reduction in State aid and the new school expenses added in Fiscal 2017. Those newly added $600,000 of expenses, however, will carry on (and grow) in FY 2018 and thereafter. And further significant reductions in State education aid are expected in FY 2018 and 2019. So although FY 2017 looks all rosy, be prepared for major increases in FY 2018 and 2019. Our Director of Metrics and Analytics is hard at work on projections for the FY 2018 and 2019 tax rates. They will not be pretty. We’ll share those in our next blog post. Sometimes this financial stuff can make your head spin. So here’s an attempt to relate the poor choices made in the current proposed budget to a possible real-life situation. So, let’s say you are a family with a couple of kids and an income level that is just adequate for your current lifestyle. And then your favorite uncle passes away and leaves you $25,000 with the stipulation that it be used to pay the mortgage for a year. All of a sudden, an extra $25,000 has been freed up in your budget since the bequest will take care of the mortgage payments for the year. What do you do with that bonus cash? Well, you could use it for the downpayment and first year’s payments on a vacation condo. That first year will be sweet. 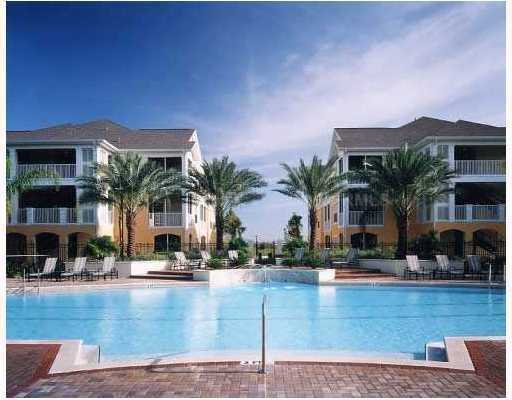 The problem, however, will be that you will now have to come up with the mortgage payments on the condo in all future years – putting a major strain on your budget after the first year. Another option might be to take at least a part of the freed up $25,000 and set it aside in the kids’ college education fund. Both these options are possibilities. One is financially responsible; the other is not. With the choices made in the proposed Scarborough school budget, we’re opting for the vacation home we can’t afford. Again, the proposed budget sacrifices fiscal responsibility for the expediency of a tax increase that appears to be reasonable… until you understand how it was achieved and what it means for the future. There’s a clear solution to this: reduce the level of expenses in the operating budget to a sustainable level. Sustainability, after all, is a hot concept these days. If there ever were a time to rein in expenses, now would be it. Instead, the proposed school budget includes an increase in on-going expenses of nearly $600,000. Reducing expenses is obviously not an easy solution, but the longer we avoid it, the more difficult it will become. You know the old saying about biting the bullet. With that windfall artificially reducing the schools’ ongoing expense base, we’re in the ballpark. But take out the windfall and we’re out of sight. The “first reading” budget needs to be drastically overhauled to produce one that is fiscally responsible. This entry was posted in Uncategorized on April 13, 2016 by Site Author. In the budget process in other towns, Council often gives an expense parameter beyond which a budget is not to exceed. Does Scarborough do this ? Yes, for the first time this year, the Council set an objective of “around 3%.” So, for bottom line purposes, the 3.3% total mil rate increase was more or less met. 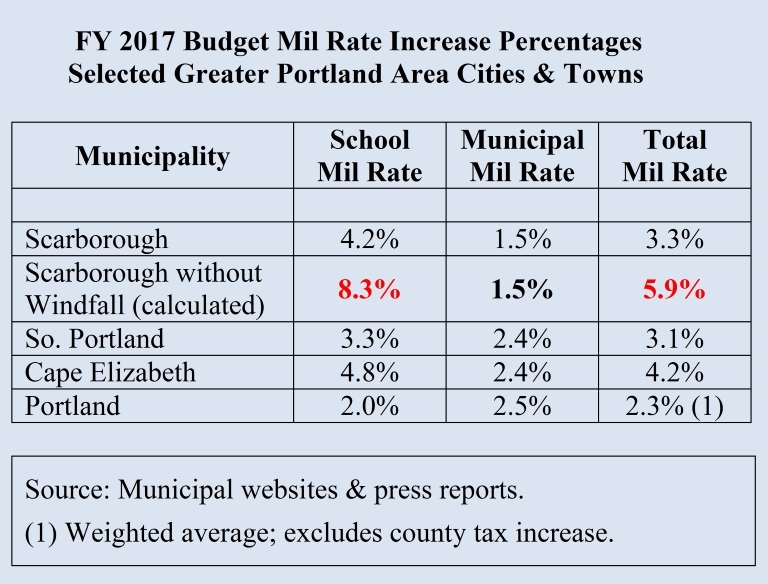 The components of that are a school mil rate increase of about 4.2% and a municipal operations mil rate increase is 1.5%. This would be fine and dandy if it had been arrived at without injecting the one-time $1.6 million windfall from the excess Wentworth borrowing into the equation. As it is, that $1.6 mil has allowed the schools to effectively ignore the realities of (1) adding $600,000 of new and ongoing expenses and (2) future additional State aid cuts in the million dollar ballpark. When the FY 2018 and 2019 budgets come along, those realities will still be with us… but there won’t be another $1.6 million dropping from the sky to pay for them. Thus the financial irresponsibility of the current budget… it looks like peaches and cream in FY 2017, but thereafter it will ugly.